This kitten called Puffin was sculpted from life at three weeks of age by M. Pena. 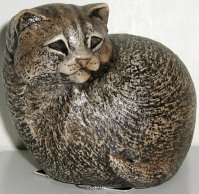 This kitten is cast in natural stone. It is 3" high x 2 3/4" wide. For indoor use only. New, original tags attached.